Owners of Micro Small and Medium Enterprises (MSME) complain that the power tariff has been structured in such a way that it benefits bigger units. For the past seven years, the KC Soni Steel Unit at Kumbra village in Mandi Gobindgarh had been lying shut after it was declared a Non-Performing Asset (NPA). The building was pulled down, the machinery was dismantled and the land was auctioned. But off late, the steel factory has been witnessing signs of life with new steel rolling machinery. Once declared sick, the steel industry in Mandi Gobindgarh, often referred to as the ‘Tata Nagar of Punjab’, now appears to be in good health. Mohinder Gupta, president of the Mandi Gobindgarh Induction Furnace Association, says production of moulded steel has doubled from 1.5 lakh tonnes per month two years ago to 3 lakh tonnes a month this year. The number of functional furnaces has gone up from 65 to 95, while the rolling mills count as gone from 200 to 250, and the furnaces area working three shifts instead of one. But while the steel sector is booming, other industries are not so upbeat. Owners of Micro Small and Medium Enterprises (MSME) complain that the power tariff has been structured in such a way that it benefits bigger units. They rue that the government is yet to set up any focal points for small industry. 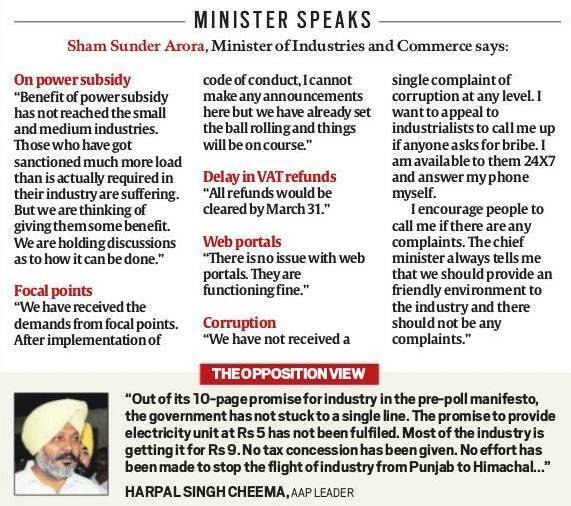 Industrialists also complain of corruption at lower levels, delay in VAT refunds, tardy implementation of ‘Invest Punjab’, and non-functioning web portals of the government under the new industrial policy. Coming back to Mandi Gobindgarh, the turn-around for Soni’s sick unit came after Royal Ispat Udyog took over the unit as Royal Steel Alloys. Jayant Data, one of the owners, said they are all set to start re-rolling soon. They have also taken over another sick furnace unit called Royal Concast, which is already functional. “Times have changed, the steel industry is looking up again,” Data tells The Indian Express. Mandi Gobindgarh, where the steel moulding units had gone silent till two years ago, are abuzz with activity. The auction notices of banks, once commonplace, are a thing of the past. “The industry is reviving now. Earlier, the work had stopped. Now, I get work whenever I come,” said Maghar Singh, a truck driver while pointing at the revived Jai Narayan Steel Unit. 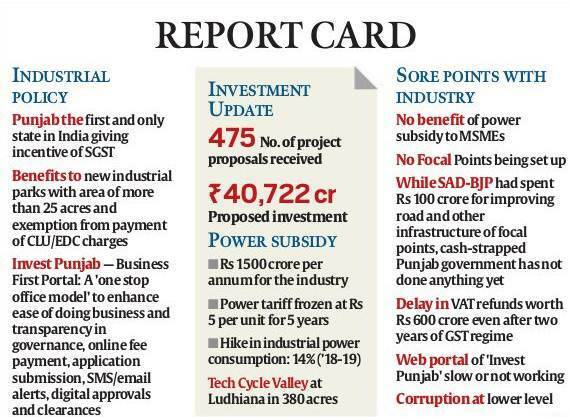 Data attributes this to the Punjab government’s power subsidy to industrial units that provides a unit for Rs 5, as well as announcement of incentives under the ‘Invest Punjab’ and ‘Ease of Doing Business’ initiatives of the state government. 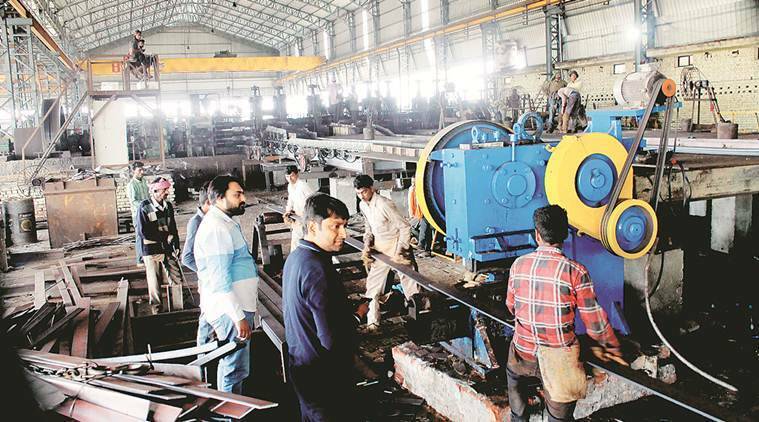 Punjab’s Industries and Commerce Minister Sunder Sham Arora claimed that 10 closed steel units have been revived, and NOCs have been granted to around 60 new units and 38 expansion units. Mohinder Gupta of Gyan TMT also attributed the turnaround to the GST regime, “that ended Inspector Raj” and the Centre’s ‘Make in India’ initiative. Vinod Vashisht, president of the Rolling Mill Association, linked the upsurge in the industry to a global boom in the steel industry. He is, however, miffed with the “officials of the state government”. “Several incapable officials are made to handle important tasks related to the industry. If the incentives promised are not rolled out at the right time, what is the fun?” he asks. Moreover, the industry’s grouse is that not much development is taking place at home. “The consumption of steel in Punjab is just 20 per cent. The rest is being supplied to states like UP, Bihar and Rajasthan,” said Gupta. MSME owners rue that each power unit costs them between Rs 8 and 14 because the tariff comprises two components — fixed total charges and actual consumption. The Rs 5 per unit fixed price is for consumption and fix charges vary from Rs 100 to 250 per mega watt. Hence, bigger units having more consumption benefit but smaller units are suffering. “For my units having 90 KW load, every unit is costing around Rs 9. Besides, we have to pay an over and above surcharge of 20 per cent,” said Badish Jindal, president of the Federation of Small Sale Industries Association (FOPSIA). He added that there are 20-30 lakh MSME units across Punjab with 1.5 lakh units in Ludhiana alone. These include hosiery, bicycle parts, fasteners, auto parts, machine tools, garments, sports, paper, textiles, yarn etc. Expensive power has become a bigger setback for this type of industry. The higher GST slab coupled with lack of support from the state government has also hit the sports industry, concentrated largely in Jalandhar with about 550 units employing 1-1.5 lakh people.The fixed power tariff has not helped this industry either. “When Congress was preparing its manifesto, Manpreet Badal and Rajinder Kaur Bhattal both came to us, held a meeting and listed the promises in the manifesto. After that, nobody came,” said Ravindra Dhir, convenor of the Khel Udyog Sangh Sangharsh Committee, Punjab. He rued that the VAT refunds were delayed despite government announcements. A promised research and development centre has been forgotten. “Our cottage industry runs from residential areas. The government promised a special Sports Focal Point but did nothing,’’ he claimed. The disillusioned manufacturers are now shifting to trade. ‘’We are now shifting to trade instead of manufacturing. We won’t lose anything but Punjab will lose its sports industry,” warned Dhir. The power tariff slabs have also hit cottage and mid-sized units forming the textile industry in the state. Delay in VAT refunds, delay in setting up of infrastructure are the common grouses. Ajit Singh Lakra, president of the Chamber of Knitwear and Textile Association, said, “The industry needs hand-holding. What is the government doing? There is so much of corruption, no ease of doing business. Is anyone expanding?” he asked. He rued that the government could not set up a trade and exhibition centre which was a primary need of the industry. Punjab’s cycle industry is not enthused by the state government’s idea of setting up a ‘Cycle Valley’ near Ludhiana. Most of the cycle assembling units in Punjab are small and medium units are dependent on ancillary units for their parts. Their biggest challenge is to upgrade the traditional bicycle and pedal rickshaws that are fast losing customers. Bhogal underlined the need to upgrade and manufacture cycles that are in sync with the demand of the present generation that buys high-end bikes manufactured in China and Taiwan.